Here are some of the titles we return to again and again to refresh our memories on fruits tart and sweet when we are lacking fruits to eat. The Fruits and Fruit Trees of America; the culture, propagation, and management, in the garden and orchard, of fruit trees generally; with descriptions of all the finest varieties of fruit, native and foreign, cultivated in this country by A.J. Downing and corresponding member of the Royal Botanic Society of London; and of the horticultural societies of Berlin; the Low Countries; Massachusetts; Pennsylvania; Indiana; Cincinati, etc. – now that’s a mouthful! The Apples of New York, Volumes I and II, S.A. Beach assisted by N.O. Booth and O.M. Taylor, Report of the New York Agricultural Experiment Station for the Year 1903. More contemporary books are noted below. Our two favorite sources are listed first. The New Book of Apples by Joan Morgan, Alison Richards, and Elisabeth Dowle. 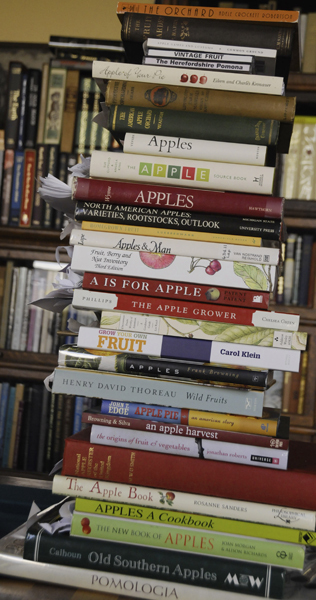 Their publisher, Ebury Press, calls it “the definitive guide to apples, including over 2,000 varieties. Fruit, Berry and Nut Inventory edited by Kent Whealy and published by Seed Savers Exchange of Decorah, Iowa. We have the third edition published in 2001 and know we need to upgrade soon. Old Southern Apples by Creighton Lee Calhoun, Jr. The revised and expanded edition is published by Chelsea Green. Also by Chelsea Green, Michael Phillips The Apple Grower, A Guide for the Organic Orchardist. We do not own a second book by Phillips, The Holistic Orchard: Tree Fruits and Berries the Biological Way, but imagine it is just as good as the first. A cute little book with great drawings and descriptions of heirloom apples is by Roger Yepsen and simply titled Apples. W.W. Norton & Company published this book in 1994 but it is still a treasure. A new book on our desk is The Illustrated World Encyclopedia of Apples: A comprehensive guide to over 400 varieties accompanied by 60 scrumptious recipes by Andrew Mikolajski and published by Lorenz books. Apple of Your Pie: A Collection of Apple Pie Recipes and the History of Apple Growing in America by Eileen Maher Kronauer and Charles Kronauer. We found a copy of this interesting book of apples at a sweet little restaurant called Ariana’s in Orford, New Hampshire. Another fun Common Ground book – Apple Games and Customs. Orchards written by Claire Masset is great little book – we hope to have it and a sister book, Making Craft Cider, put out by Shire Publications for sale at the farm stand. Please check our post on hard and sweet cider titles. This entry was posted in Heirloom Apple Varieties, Heirloom Apple Varieties - Books and tagged antique apples, Heirloom apples, uncommon apples on October 17, 2012 by Jane Booth. You really ought to check out The Apple Lover’s Cookbook by Amy Traverso, with recipes for heirloom apples! Thanks Susannah … !!! We have been in the midst of a move and renovation — while I was packing I came across a copy of Amy Traverso’s book that had migrated away from the rest of my apple books and indeed, it will be added to the bibliography.